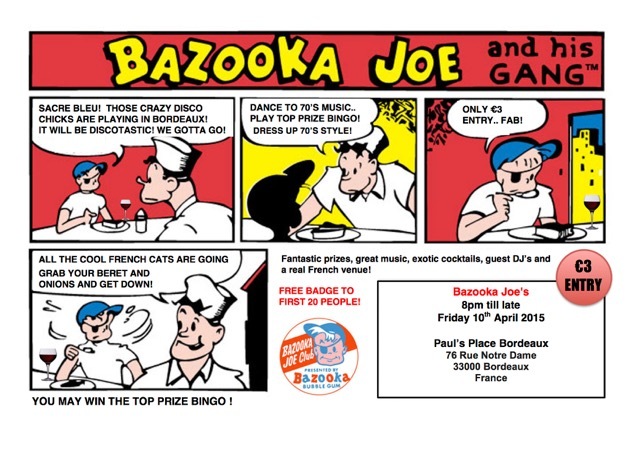 What began as a quirky idea to put on a Bazooka Joe’s night in France turned into a full-on disco mission when French air traffic controllers decided to strike on our day of departure, and we had to change our flight tickets to train tickets. The ambitious (some might say crazy) idea to pack the whole disco into a disco case and take it to Europe weighed heavily on the two of us as we (mostly Dolly Debris, as she’s hard like that) swung the Samsonite up onto Eurostars and TGVs as we railed through England and then France. Changing only at Disneyland, would you believe. It might have looked like chutzpah to hold a party in someone else’s town. In fact it was more than that. This was a pure commitment to disco. The venue, Paul’s Place, was situated in a most beautiful part of Bordeaux called Chartrons. The eponymous Paul is originally from Cambridge and moved to Bordeaux many years ago. Big on literature, he holds many events in Paul’s Place and serves meals every day of the week. I believe this was his first disco, however. Paul was generous enough to allow us the run of the place for a couple of hours when he went out to stock up on cocktail ingredients. I don’t think he had fully prepared himself for the transformation from bar/restaurant to bingo hall/dancefloor! Also super generous, local bordelais Benjamin Charles aka Michel Bananes Jr from fab local artists’ gallery N’a qu’1 oeil lent us his sound equipment, despite having a lot on his plate himself that weekend. Merci infiniment à Ben for this generosity. We really appreciate it! This really was a Bazooka Joe’s just like the ones we have in Brockley (we only do them in places which start with a ‘B’ so watch out Berlin and Bognor Regis). From the lights, to the sweets, to the bingo prizes bought in Deptford, we really did take south London to Bordeaux. We had the same wigs, shoes, peach dresses and bingo balls that we usually have. I repeat, all of this paraphernalia fits into 1 case of less than 20kg in order to fit into an Easyjet plane’s hold! Our audience was made up of a brilliant European mix, due to the fact that we were (primarily) in Bordeaux on a work project. We are really indebted to all of you who came, not just French, but Lithuanian, Belgian, and Dutch too, as well as some Brits, friends and relatives of Paul. It was also fantastic to see my old pal Adeline from past Habitat days, so pleased you came Ad! Anticipating that the Europeans might not appreciate our ‘ironic’ sense of humour and our unusual enjoyment of playing bingo, it was really great fun to see everyone partaking in the bingo, and some taking it more seriously than you might imagine, considering the prizes! I find that bingo always brings out that competitive spirit! Also the French reputation for being slow or reluctant to dance was not too evident, as they whipped up a storm on the dancefloor! Particularly impressive was the bodypopping and the knowledge of lyrics from the men when it came to classic tunes by The Sugarhill Gang and Grandmaster Flash. Going 80’s next time looks like a dead cert. Apologies for the bad dancefloor pictures. As always, I ask for you to send me any photos you took if you were there as they will surely be better than mine. It’s always hard to multi-task as DJ/bingo mediator/translator/photographer, using just a phone to take photos. Bazooka Joe’s is back in Brockley in May. We are doing a special night on 30th May, the first Saturday of Brockley Max, upstairs at the Talbot Pub. See you there!